Almost a decade-and-a-half later, it’s easy to look back at X-Men and see everything that the film got wrong. We’ve been blessed with some incredibly faithful comic book adaptations lately. Looking at how well the Marvel Studios films have brought their characters to life, we can look back at X-Men and bemoan the dull, Matrix-inspired leather look to all the characters. While the film nailed Wolverine, Professor X, and Magneto, we can complain about the characterizations that missed the mark (Storm, Cyclops). We can comment how small-scale X-Men is, how it lacks in any real crazy super-hero action. But I think that first film still works incredibly well, and I can forgive most of its flaws by understanding the context of the time in which it was made. The real disappointment is what happened afterwards. Bryan Singer returned in 2003 to direct X2, which at the time many, myself included, viewed as even stronger that the initial film. The film’s ending was extraordinary, with the death of Jean Grey and the very brief glimpse of the Phoenix effect right before the end credits rolled, driving fans into a frenzy of anticipation and excitement. (It was a feeling similar to the glimpse of Thanos at the end of The Avengers, nearly a decade later.) Rather than just the occasional stand-alone movie, it was clear that these X-Men films were daring to tell a much larger, more epic continuing saga, and the ending of X2 was a promise that Mr. Singer and his team were daring to take on possibly the most famous and best of all the X-Men story-lines: The Phoenix Saga. Just when I had given up all hope in the series, director Matthew Vaughn gave us 2011’s X-Men: First Class, a prequel film filled with tremendous fun and energy. (Click here for my review.) We then got a much better second Wolverine film, 2013’s The Wolverine (click here for my review), and things were looking up. Then came the announcement of Days of Future Past. I was excited but I also had my worries. I was happy to see Bryan Singer returning to the X-Men universe (something I’d never expected to see happen). However, I hadn’t been a huge fan of many of the films Mr. Singer had directed in the intervening years (though I’m one of the few people in the world who liked Superman Returns), and I wasn’t sure if his sensibilities, which worked so well for X-Men back in 2000, were the right fit now that we’d seen far more faithful comic book adaptations. I loved the idea of adapting Days of Future Past, one of the most famous and greatest X-Men stories ever told (second only, perhaps, to the afore-mentioned Phoenix Saga), but I was also fearful of seeing this beloved story-line mangled. I loved the hook of having the First Class group be the “present day” X-Men and the original trilogy’s actors be the “future” versions. That was a super-cool idea and a great opportunity to see some of those great actors/characters again and, perhaps, give some better closure to those original films. Could Mr. Singer pull it off, and bring some magic back to this franchise? For the most part, yes. I’m pleased to report that, while the film has flaws a-plenty, over-all I thought X-Men: Days of Future Past works marvelously well. It’s a fun super-hero time-travel adventure, and most importantly the film has a phenomenal ending that, in a way that feels earned and not cheap, undoes all the sins of Brett Ratner’s X-Men: The Last Stand and gives an emotional, sweet conclusion to the original X-Men trilogy. In the original comic-book story, written by Chris Claremont & illustrated by John Byrne and Terry Austin, we see a dark future in which the mutants have been hunted almost to extinction. One of the few surviving X-Men, Kitty Pryde, has her consciousness flung back in time into the body of her younger self, in a last-ditch, desperate attempt to change history and prevent that nightmarish future. It’s a story that has become almost cliche and overly-familiar in the many decades since it was first published, but Days of Future Past was a ground-breaking story at the time, and the many times it has been imitated doesn’t dull the original story’s potency. The film uses that basic story hook but little else of the original story. This is one of my biggest complaints about the film, that so little of the original story-line is present in the adaptation. I knew this would be the case, because the filmmakers have had to totally re-work the story to work with their already tortured, messed-up continuity of the original films, the Wolverine solo films, and the First Class prequel. Still, it hurts. There are so many wonderful moments from the original comic that I’m bummed to never get to see on-screen. I mean, really, how can you do Days of Future Past and not give us the iconic moment of Wolverine getting incinerated by a Sentinel, all the way down to his adamantium bones??? My mind is boggled. And while I actually dig the Sentinels in the film, it was a huge mistake not to hew more closely to the iconic original design. I like the angle that these robots can adapt to mimic any mutant’s power (and thus defeat and kill them). That’s a spin on the original Sentinel idea that makes sense. But, really, couldn’t their un-powered, original form have been made to look more like the original design?? Another big missed opportunity. But as I noted, the basic Days of Future Past framework has here been reworked for an entirely different purpose: to unite the two X-Men casts and straighten out the film series’ messed-up continuity. I applaud this goal, and I was impressed by the ways in which the film’s narrative was able to, for the most part, do just that. For non-fans I think the time-travel stuff works (again, for the most part), and will be exciting and understandable to them. For more attentive fans, this films makes a lot of efforts to dodge and weave and nip and tuck, making connections here and fixing problems there. It’s an impressive balancing act, though I could occasionally see the narrative straining under the effort. The original comic had a simple structure. Good present day, terrible future. Let’s change the future to ensure the good present day continues to a happier outcome. But the challenge of the film is that we don’t actually get to see the “good” time on-screen. We just have to remember it from other films. Here in Days of Future Past, both time-periods are pretty bad. The “present day” is 1973, in which the First Class team of X-Men have been disbanded and mostly killed, while Magneto is in prison and Charles Xavier is a broken wreck. I like all that stuff, and it makes sense as an exploration of what happened after the events of X-Men: First Class. But it means that we get weird-when-you-think-about them scenes such as future Wolverine in 1973, looking for Professor X and being shocked at the run-down condition of the school and the mess that is 1973 Charles Xavier. You’d think it’d be the present-day characters horrified by the future, but instead it’s future-Wolverine shocked by the “present.” It all works in the context of the film — I’m not using this example to point out something that is bad about the movie — it’s just an example of how weirdly bent the original Days of Future Past narrative has been in order to work with the film series. OK, so what’s good about the film? The film tells us right from the beginning that this is a Bryan Singer X-Men film, as the film’s main title appears over a CGI sequence shooting through DNA, just like the original films did, and John Ottman’s score proclaims the original X-Men main theme. I’ve gotta say, both things brought a big smile to my face. It’s great seeing members of the original cast again. Patrick Stewart and Ian McKellan are so perfect in their roles. I wish they had more to do in the film, but they have just enough for me to be happy. Every scene with them is great, and frankly it’s all a gift as I never, ever expected to see either man playing these characters ever again. Their final scene together, with mortally-wounded elder Magneto’s final words to Charles, are fantastic. And, you know, while I have lots of complaints about the original X-Men trilogy’s depictions of characters like Storm, Kitty, and Colossus, it’s great fun to see Halle Berry, Ellen Page, and Daniel Cudmore back in these roles. I was also thrilled that Shawn Ashmore (who, as Iceman, was a supporting character from the comics elevated to central importance in the original films) was back and had a lot to do. The best aspects of the First Class prequel were James McAvoy and Michael Fassbender as the younger versions of Charles and Erik, and thankfully this film also focuses strongly on those two characters and gives those phenomenal actors a lot to do. Mr. McAvoy and Mr. Fassbender share some really meaty scenes together (like their argument on the plane), and those are some of the best moments in the film. First Class’ other casting success was Jennifer Lawrence as the young mystique, and thankfully she also has a lot to do in the film, and I enjoyed that the film once again pivots on this character, caught between Professor X and Magneto. I appreciated the film’s many attempts to carefully balance the previously-established film continuity. Maybe none of us like The Last Stand’s breaking up of Bobby Drake and Rogue (in that film Bobby suddenly seemed to have a thing with Kitty Pryde), but that film happened and we all saw it. So it was the right decision to have Bobby and Kitty still be a couple (or, at least, to have a close bond) in the future sequences. (Luckily Bobby ends up with Rogue the way we all wanted him to by the film’s end, though here again we see the film’s tortured narrative at play, because while that ending — in which we see Bobby with Rogue, and Kitty sharing a classroom with Colossus, a sly nod to that popular couple from the comics — made me very happy, it must be confusing to a newbie who watched the film in which Bobby and Kitty seem to be together and then, suddenly, in the end they’re not.) On the other side of the coin, I was happy to see Professor X alive and well in the future timeline, even though he was killed off in The Last Stand, and I was happy the film didn’t waste any time giving us an explanation for that. Professor X has survived all sorts of crazy things in the comics over the years, it’s not a big leap for me that he was able to somehow survive his “death” at the hands of the Phoenix. I didn’t need to know more. I wish this film had more action, particularly in the future timeline, but what action we did get was pretty sweet. Magneto picking up RFK stadium and dropping it down as a way to surround and isolate the white house was a particularly great bit of business. I also loved the Magneto break-out sequence with Quicksilver. Peter Dinklage as Bolivar Trask. Loved every moment he was on screen, wish he was in the movie more. The ending, which was so perfect. More on that shortly. The absence of Rogue from the future timeline. Everything in the future timeline, most particularly the eventual tragic massacre of the future X-Men by the Sentinels, would have been better had Rogue — so important in the original trilogy — been there. I am stunned at her omission. Was Anna Paquin not available or not interested? Or did Mr. Singer and his writers for some reason not want to include her? I did read in the months prior to the film’s release that there was one scene set in the future timeline with Anna Paquin as Rogue that was filmed but then cut. I’m sure they had their reasons for cutting that sequence, but the result is a big gaping hole in the story-line. Storm’s death in the final battle has weight, but I didn’t care at all about the other new-to-this-film characters we saw getting massacred. I guess I should have been glad to see other X-Men from the comics included in the film, characters like Bishop and Blink and Sunspot and Warpath, but really, I don’t care about those characters in the comics and I certainly didn’t care about them in the film. But had we seen Rogue get killed along with Storm, that would have taken the story to a whole new level at the end. I mentioned the lack of action. This is a surprisingly action-free installment of a big comic book super-hero movie. There’s a very short opening action sequence with some future X-Men. There’s the botched attempt to assassinate Trask. And then, until the end, that’s pretty much it. I wish there was more, and in particular I wish we’d seen more future X-Men versus Sentinel action. This film gets a little slow in the middle, in the period between the botched assassination attempt and the big climax with parallel action in both timelines. We could have used one more big action beat in the middle there somewhere. Some of the time-travel stuff bugged me. They try to mine some mid-movie drama from Wolverine getting shocked by seeing William Stryker (the man responsible for forcibly bonding Adamantium to his bones) and for some reason that almost sent his mind back to the future, but that seemed pretty silly to me, a transparent way to keep Wolverine out of action at a key moment. (Although I did love that Stryker — an important character in both X2 and X-Men Origins: Wolverine — popped up in this film as well. That was a nice surprise.) There’s also a lot of business in the future of them needing to buy Wolverine’s consciousness the time he needed to do what needed doing in the past. But if Wolverine was able to change history, since that was all in the past, wouldn’t those effects have taken place instantaneously once Wolverine’s consciousness was sent back? There’s some line about the changes to the timeline not taking effect until Future Wolverine woke back up, but that was pretty weak to me. 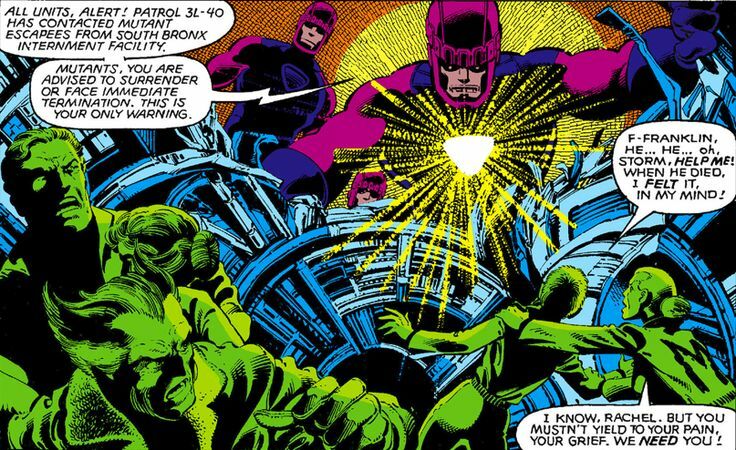 I like the notion that the Sentinels could adapt to mimic any mutant power, the better to murder them. I like the notion that Mystique wound up unwittingly being the key to that. But Mystique’s ability is just to LOOK like any other mutant or human. She couldn’t actually mimic their powers. That was ROGUE. So, um, Mystique being the key to the Sentinels developing that power doesn’t work. I didn’t like that Charles had his legs again in 1973 because of Hank’s super-drug. Wouldn’t his being confined to a wheelchair (as a result of the injury he sustained at the end of First Class) be one more powerful reason why 1973 Charles would be such an emotional wreck? (With the 1970’s setting and Charles being a cripple with long-hair, I was drawing a lot of mental comparisons to Born on the Fourth of July.) I suspect the decision to have Charles walk was one more way the narrative was twisted to try to draw a distinction between Future Charles (in a wheelchair) and Young Charles (walking), but since the ending of First Class hinged on the crippling of Charles, that particular plot twist in this film didn’t work for me. Another example: Wolverine’s claws. To draw a distinction between the two timelines, we see Wolverine with Adamantium claws in the future, but bone claws in the past. It works, but it’s weird to see Wolverine with Adamantium claws again in the future when we just saw those claws get destroyed in The Wolverine. As with Professor X’s apparent resurrection some-time between the events of The Last Stand and the future timeline, I’m OK with not getting an explanation for how Wolvie got his Adamantium claws back. It’s just another weird example of this film’s twisted timeline in that they felt they had to give him his bone claws in the past (presumably to not conflict with the timeline of X-Men Origins: Wolverine, though there are nevertheless a million conflicts with that movie anyways, such as the age of William Stryker) rather than vice versa (having Adamantium claws in the past, and bone claws in the future, post-The Wolverine timeline). Speaking of this film’s twisty narrative, although I admire how hard the writers tried to address every potential continuity problem they could, sometimes their efforts only pointed out other problems. They make a point of saying how Mystique’s capture “eventually” led to the development of the Sentinels. That’s because while we see Sentinels created in 1973, they didn’t exist in the world of the original X-Men films (presumably set around 2000 — a caption in the first film tells us that the story was set “in the not too distant future”), and only AFTER the events of those films would they be released and kill all the mutants (the events of this film’s future timeline). But that slow burn, while making sense continuity-wise, takes some of the narrative immediacy out of this film’s story. We have to stop Trask in 1973! Because otherwise he will create and release mutant-killing robots in, oh, some-time in the next half-century. I also have trouble tracking all the mutant activity in First Class and this film (even before the timeline changes and the public gets an eyeful of Mystique and Beast in Paris) with the events of 200’s X-Men, when it feels like the existence of mutants is a very new phenomenon. I was surprised at the brutal revelation that most of the supporting characters from First Class had been killed off between movies. I feel a little bit like, “why did we bother getting to know those characters in the last film if they were just going to kill them all off? ?” but I do like the surprising viciousness of that little bit of backstory. But how/why did Havok survive? What the heck was he doing in Vietnam? Was he drafted? If we are to understand that in the X-Men universe there was a battalion of mutant soldiers, I again am confused as to how/why the general public would be so surprised by the existence of Mutants in 2000’s X-Men. OK, let’s talk about the ending. I thought the film sagged a little bit in the middle, but things really came to life in the final act, as we follow unfolding trouble in both the present day (as Magneto goes full-on super-villain and attacks the White House) and the future (as the Sentinels find the X-Men and start killing them). This was exciting stuff, with some great action beats in both timelines as well as some rich emotional material. Mystique’s moment of choice in 1973 is great, and as I’d noted above the massacre of the Future X-Men works well. We get a great sense of mounting desperation in both timelines as things look increasingly grim for our heroes in both eras. In the months leading up to this film’s release, I wondered what the ending would do to the timeline of the films. Obviously the X-Men would find a way to eliminate the nightmarish future timeline. But would things go farther? Would this film’s story somehow fix what happened in The Last Stand? Would all the original X-Men films be wiped from continuity, leaving the First Class cast free to have further adventures without the need to hew to the continuity of the original films? I was delighted with the solution that Mr. Singer and his writers found. The ending to this film was everything I had hoped for. When Future Wolverine opened his eyes in his bed in the X-Mansion, I started to hope. The final few minutes of the film were just perfect. Every sin of The Last Stand was washed away, and in beat after beat I saw the characters just the way I wanted them to be. Thank goodness we got a brief glimpse of Anna Paquin, and we saw Rogue happy with Bobby. We saw Kitty and Colossus. We saw Kelsey Grammar as old Beast! (LOVED that cameo!) And then, most importantly of all, we saw Scott and Jean. I freely admit to getting a bit misty-eyed when we (and Logan) got our first glimpse of that redhead standing in the Professor’s doorway. I also can’t emphasize enough how important it was to me that this film resurrect not only Jean, but also Cyclops, who is a critical X-character who was totally misused and needlessly written-out of the series in The Last Stand. I mentioned the first film but, of course, the ending of this film wipes those events away. None of those films happened in this new continuity. But what makes the film’s ending so perfect to me is that, while the original trilogy has been erased, thus leaving the First Class characters free to continue in all-new adventure set after 1973, now no longer tied to having to line up with the events of the original films, I don’t feel like those movies were erased. Quite the contrary, the ending of this film gave those original films a perfect ending, a beautiful bow on the top. I feel like that messed-up trilogy has now been fixed and given a proper ending, and that’s so special and lucky. I am curious as to where the film series will go from here. More stories set in the 1973 world? Or will they re-cast again to bring the series back to present day (now post-2014, so forty-plus years after the events of this film) to give us all-new adventures with a once-again bald, wheel-chair-bound Professor X and his X-Men? I also have plenty of continuity questions remaining. If, in this new timeline, Wolverine was never found by Stryker, did he never get his adamantium bones/claws? (That’s a pretty major change to that character!) I am curious and excited to see what is next. Lastly, before I wrap up, let’s discuss the post-credits stinger. It’s worth staying for, but it’s not a great stinger. They’ve tried to do what Joss Whedon & co. did in The Avengers, showing us a glimpse of a villain who will appear in a future film, someone not known to general audiences but definitely known to comic book fans. But this stinger doesn’t work nearly as well as the Avengers one. Even if you didn’t know who Thanos was, that scene still clearly connected to the events of the film. You might not know Thanos’ name, but you understood that this was the super-baddie behind the attack on Earth. The scene in Days of Future Past, by contrast, is totally random, with no connection to the events of the film. Also, Thanos was a surprise, whereas here they had announced the title of the next X-film as X-Men: Apocalypse months ago. So the second I saw those sand-dunes, I knew what was coming. Lastly, Thanos looked perfect, whereas En Sabah Nur looked, well, like a pale skinny kid. Oh well. I have certainly had a LOT to say about Days of Future Past. Any attempt to a) adapt such a famous and well-loved story, and b) unravel this franchise’s tangled movie continuity, was going to result in much fodder for discussion. I admire this film’s ambition in attempting to do both of those things. And while it doesn’t always succeed and while there are certainly plenty of missed opportunities and things I’d really hoped to see, but didn’t, in a film version of Days of Future Past, over-all I quite enjoyed this film. Nailing the ending is a high reason why, and that buys a lot of leeway for me to forgive the film’s other flaws. This was a fun, successful X-Men movie in its own right, and an impressive case of fixing and ailing franchise. I am excited to say I have enthusiasm for what comes next. I have long said that, with the X-Men’s decades-long, rich history of stories from the comics, this should be a franchise that can continue indefinitely, with a new X-Men film every few years, adapting great stories from the comics and, as necessary, with new characters rotating through. With X-Men: Apocalypse already in the works for 2016, for the first time in a long time I have hope again that perhaps this is the direction this series will take. There are lots more amazing X-Men stories that can be told. I hope the makers of these movies have learned from the franchise’s past mistakes and will take this series in a stronger direction from here, with greater faithfulness to the source material and a tighter sense of direction from film to film. Let’s see!